Jason Tovey's late penalty secured a deserved victory for the Dragons in an entertaining final game of the season against Treviso. The Italians led 11-10 at the break through Fabio Semenzato's try while Tyler Morgan replied. Will Harries's try put Dragons ahead but Manoa Vosawai's try and Alberto di Bernardo's penalty restored Treviso's lead. Tovey's kick claimed the win but Treviso secured their European spot. Treviso needed to better the result of rivals Zenre at Glasgow in order to secure their European spot and avoid finishing bottom of the table. Glasgow's 54-0 win over Zebre meant Treviso will take their place as Italy's representatives in next season's new European Champions Cup. Victory for the Dragons ended a run of six defeats and a draw but they ended the season as the lowest placed of the Welsh regions. Tovey secured the first points of the evening, putting over a 30-metre penalty, but the visitors had the better possession and territory for twenty minutes of the period. 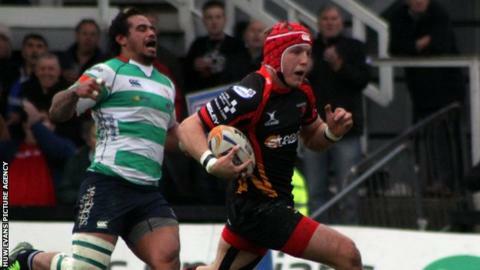 Treviso were powerful up front and had the Dragons on the back foot on a number of occasions close to their own line. Di Bernardo was unable to add the conversion and the Dragons were then reduced to 14 men when Harries was sent to the sin-bin midway through the half for interference at a ruck. Fly-half Di Bernardo extended the Treviso lead to 8-3 with a straightforward penalty in front of the posts on 24 minutes. But the Dragons responded and young centre Morgan turned on a superb piece of magic on the half-hour to get them back into the game. The 18-year-old took a ball in midfield forty metres before embarking on a powerful run which ended in him scoring near the posts and giving Tovey an easy conversion. But two further mistakes by the home side saw di Bernardo land a further penalty and Treviso were ahead at the interval. The Dragons emerged the more positive of the sides after the interval and another piece of magic from Morgan saw them get a second try of the game. The youngster booted the ball down the right for Harries to chase and dive over for a try that Tovey converted. There was just one point in it and, when home flanker Lewis Evans was sin-binned, Di Bernardo gave Treviso the lead again with a mid-range penalty. But they blew their chances of victory by giving away a penalty 30 metres out that Tovey landed to hand his side a well deserved win. Newport Gwent Dragons: Hallam Amos, Tom Prydie, Pat Leach, Jack Dixon, Will Harries, Jason Tovey, Richie Rees; Phil Price, T. Rhys Thomas, Duncan Bell, Andrew Coombs (c), Matthew Screech, Lewis Evans, Nic Cudd, Taulupe Faletau. Replacements: Sam Parry, Owen Evans, Bruce Douglas, Rob Sidoli, Jevon Groves, Jonathan Evans, Kris Burton, Tyler Morgan.